African Safari Club Cruises - Indian Ocean and African river cruises on smaller ships. Includes fleet, itinerary and charter flight information. American Cruise Lines - Small cruise line offering cruises on the US Eastern Seaboard on American-flagged small ships (none larger than 100 guests). American Safari Cruises - Small line with sailings to Alaska, Pacific Northwest and Mexico on small yachts (12-36 guests each). Itineraries feature close-up viewing of wildlife. Azamara Cruises - Small "deluxe" cruise line positioned below luxury and above premium. Mid-size ships on European, Caribbean and Asian itineraries. Includes online booking. Captain Cook Cruises - Small ship, destination-oriented line with ships operating in Australia and the South Pacific. Offers online booking. Carnival Cruise Lines - Popular, mass-market cruise line with sailings to the Caribbean, Mexico, Europe and Alaska. Information about destinations, excursions, and life on board. Direct bookings. Celebrity Cruises - Premium-priced line with mid to large-size vessels sailing to the Caribbean, Alaska, Europe, and South America. Offers online booking. Clipper Stad Amsterdam - Tall ship sailing vessel built in modern times but with traditional sails and ambiance. Dutch-registered, voyages in Europe and the Caribbean. Charters available. Compagnie des Îles du Ponant - French line with modern sailing vessels on exotic itineraries around the world. Coral Princess Cruises - Small cruise line with small-ship expedition cruises in Australia's Great Barrier Reef, New Zealand and small South Pacific islands. Costa Cruises - Large, "Italian style" contemporary cruise line with sailings in the Mediterranean and Caribbean. Offers online booking. Cruise West - Small-ship line (maximum capacity 102 guests) sails in Alaska, the Pacific Northwest, Mexico, Costa Rica and northern Asia. Includes a crew and officer blog written from the ships. Crystal Cruises - High-end cruise line with mid-size ships sailing relatively exotic, longer itineraries. Numerous theme cruises each year. Includes a travel agent finder. Disney Cruise Line - Family-oriented, Disney-themed cruises on modern and well-appointed ships. Caribbean and Mediterranean itineraries. easyCruise - Low-cost cruise holidays in the Greek islands and Turkey. A la carte pricing (food is not included), many over-nights in port, and a young demographic. Offers online booking. Fred. Olsen Cruise Lines - Premium-priced line catering for British customers with older small- to mid-sized refit to a good standard. Relatively longer, exotic cruises. UK customers can book online. Great Lakes Cruise Company - Small-ship cruise line sailing the Great Lakes between the U.S. and Canada. Owned by Conlin Travel. Hebridean Island Cruises - Very high-end Scottish luxury line operating small ships around Northern Europe, the Med, the Caribbean and South America. Pricing is more inclusive than most. Holland America Cruise Line - Large, premium-priced line known for gracious service. 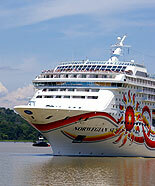 Mid-sized ships sail to Alaska, Caribbean, Europe and exotic locations including an annual around-the-world cruise. Offers direct booking. Hurtigruten the Norwegian Coastal Voyage - Exploration-oriented cruise line focused on remote, beautiful coastlines in Norway, Greenland and Antarctica. Imperial Majesty Cruise Line - Offers two night sailings from Fort Lauderdale, FL to Nassau, Bahamas on the Regal Empress. Louis Cruises - Mediterranean and Black Sea cruises on older vessels. North Star Cruises Australia - Australian wilderness and coral reef diving itineraries aboard the yacht True North, which features an on-board helicopter. Oceania Cruises - "Upscale" line positioned below luxury and above premium. Sails to exotic locations on mid-size ships. P&O Australia - Large ship sailings around Australia and in the South Pacific, departing from Sydney and Brisbane. P&O Cruises - British line with worldwide destinations including Europe, Australia, Caribbean and a World Cruise. Offers online booking. Princess Cruises - Large, mid-price cruise line with ships that sail to a wide range of North American and exotic destinations. Offers online booking. Regent Seven Seas Cruises - Small luxury line with mid-size ships (under 700 guests each) that sail on longer cruises to relatively exotic destinations. Formerly known as Radisson Seven Seas Cruises. Royal Caribbean International (RCI) - Mass-market line known for innovative large ships with features such as rock-climbing walls and onboard surfing. Sails to the Caribbean, Mexico, Alaska, Europe, South America and Asia. Offers online booking. Sea Cloud Cruises - Two tall sailing ships in the Caribbean and Mediterranean and river cruisers operating in European waterways. Sea Wolf Adventures - Classic, 12-guest vessel offers natural history and wildlife adventure cruising in Glacier Bay Alaska, British Columbia and the San Juan Islands. Seabourn Cruise Line - Luxury vacations on large yachts. Known for highly personalized service, formal atmosphere, and water sports off the ship's own marina. Sailings to a range of exotic destinations worldwide. Sikumi Alaska Cruises - Small-ship Alaska cruises on the M.V. Sikumi, a 12-guest converted trawler. Silversea Cruises - High-end line with small ships (250-400 guests). Relatively long sailings to a range of exotic destinations around the world. Spirit of Adventure - Value-oriented discovery and exploration-oriented cruises on a classic (i.e., older) ship to South America, Antarctica, Europe, Africa, and the Caribbean. Offers online booking. Star Cruises - Large Asian cruise line with modern ships sailings primarily out of Singapore, Hong Kong, and Malaysia. Offers both gambling-oriented short cruises and longer voyages. Variety Cruise - Small yacht sailings in the Greek Islands and the Red Sea. Viking Star Cruises - Small-yacht cruises in the Greek islands on sailing and motor vessels. Focus is on time in port, with an average of just 4 hours per day at sea. Voyages of Discovery - Value-oriented discovery cruises on a classic ship to exotic destinations including Antarctica, South America, Northern Europe, and the South Pacific. Windstar Cruise Line - Casual-atmosphere luxury cruises on small vessels (100-200 guests). Ships use sails and diesel power. Mediterranean, Caribbean and Central America itineraries. The World of ResidenSea - Luxury residences available for condo-style purchase aboard "The World" cruise liner. Occasionally short-term rentals are possible.